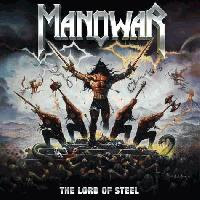 RockUnitedReviews: MANOWAR: "The Lord Of Steel"
What's your definition of kitsch? They are probably not aware of this but Manowar could indeed be the very definition of it? Well, at least when it comes to metal. None of us would ever proclaim their music and lyric to be the gospel of truth since it's always been sort of tacky and at times utterly dreadful (do they even think of women as their fans and equals?). However, they've recorded some all-time classic metal albums in my book (Hail To England, Kings of Metal) and these platters always end up on my play list of pure Heavy Metal favorites. I never really enjoyed the pompous work of "Gods Of War" and thus why "The Lord Of Steel" is a tiny step in the right direction. It's stipped down to basic arrangements and Eric Adams sings in a middle range throughout the entire album. It's clearly not his overall best performance on record though and it makes you wonder if he's past his prime? I don't mind the fuzzy (distorted) bass-lines by DeMaio because it's something new and different from the same old. The boring, repetitive drumming is however a different story, it's clearly not as impressive as the work by the late and great Scott Columbus (R.I.P.). Original drummer Donnie Hamzik (from their debut album) supposedly responsible, but it almost sounds like the work of a programmer? Several tracks are clearly inspired by Judas Priest and the opening title track gets the blood boiling without ever hitting the correct nerve. You have the worst Manowar song ever in, "Hail Kill And Die", which is basically an insult to the fans with its dull refrain and cut and paste lyric from previous songs and albums. For Odin's sake, any seven year old kid would come up with better stuff. The slower tracks saves this from being a complete let down. The ballads "Righteous Glory", "Touch The Sky" and "The Kingdom Of Steel" are easily the best moments along with "El Gringo" (the titletrack off the Christian Slater movie) and "Black List". The latter kicks off with a long bass intro done in a fuzzy style previously never used by DeMaio. It's a grower album though and it gets better with each spin, up to a certain point of course.